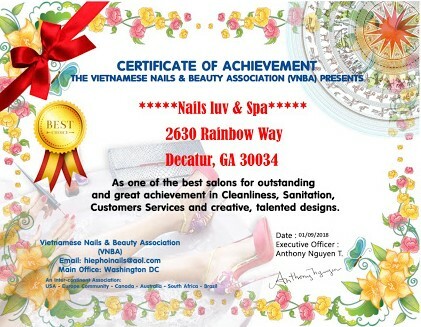 Located in the heart of Georgia, Nails Luv & Spa has become an industry leader in nail services. Our salon was founded on the idea of delivering only the finest nail and spa services to clients all over the Georgia area, and we’re pleased to offer affordable, customizable nail services from our trained professionals. We’re pleased to offer many Nails services to anyone in or near Decatur that is looking to enhance their nails. We offer all of the leading services, including Manicures, Pedicures, Spa Treatment. We have Waxing, Facials, Massage and so much more. Our entire range of services guarantees that we have the skills and experience necessary for your nail and spa needs. Our goal is to create a relaxing and clean environment so that your experience with Nails Luv & Spa is more than simply a “trip to the nail salon.” We want to make sure that you’re so satisfied that you keep coming back for years to come. Our state-of-the-art equipment and facilities along with our skilled and professional technician will ensure that you are completely happy with the finished result. We appreciate the opportunity to serve you! If you’re in need of nail treatments or want to see why so many Decatur residents come to Nails Luv & Spa, come visit us today.